Regena-Fresh is an all natural chemical free anti-microbial air freshener gel that naturally eliminates harmful elements in the air, leaving a clean scent. Lasts 30-90 days depending on the air flow. Just place on any flat surface, open the resealable top remove the inner lid and enjoy clean & fresh air. Can last up to 90 days depending on air flow conditions. The air outside the container absorbs the pharmaceutical grade oils. As the air circulates and lands on the source of the odor (mold, mildew, etc), Regena-Fresh begins neutralizing odors on contact naturally with no chemicals and continues to fight odors until the Gel has fully evaporated and is no longer in the container. 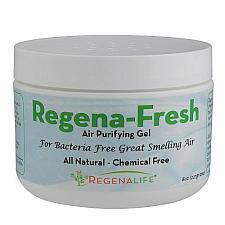 Regena-Fresh Uses: Eliminates unpleasant odors inside Cars, RV’s, Boats, Houses, Basements & Crawl Spaces. Also great for Cigarette & Pet Odors, Mold & Mildew.